The governor, the Marquess of Normanby, formally opened the new service, which was said to be the first in the southern hemisphere. 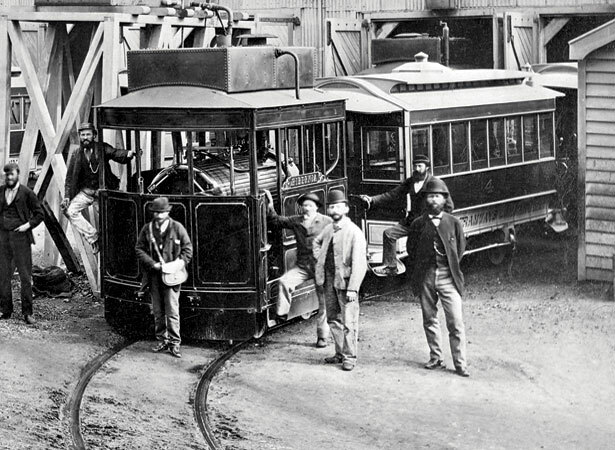 The Wellington Tramway Company had begun operating three days earlier, on 21 August. Its three small steam engines, Hibernia, Wellington and Zealandia, each hauling a passenger tramcar, ran from a terminus on Lambton Quay via Cuba and Vivian Sts to the company’s depot in King St, off Adelaide Rd. The fleet later grew to eight engines, but they were not universally appreciated. The steam trams were criticised for being noisy, dirty, frightening horses, and prone to derailing. As economic depression took hold at the end of the 1870s, the business was regularly up for public auction. Horse-drawn trams were reintroduced in 1882 and quickly proved popular. The last steam trams were withdrawn in 1892. The city’s tramway system was taken over by the Wellington City Corporation in 1900, during the era of ‘municipal socialism’. In 1904, the WCC introduced electric trams, which proved much more popular, remaining in service until 1964 (see 2 May). We have 5 biographies, 13 articles, related to Wellington steam-tram service opened.